Dan Schwartz has done a masterful job of synthesizing the thoughts of some of the best minds in the private equity business along with his own to create a superb discussion of the industry, past, present, and most importantly where it is going. This is a must–read for anyone in the private equity world and for those considering the field. Dan Schwartz was a first–hand witness to the birth of private equity in Asia and has chronicled its explosive growth over the past two decades. In The Future of Finance he uses an insider s perspective to full effect, pulling together the views of many practitioners to illuminate both the roots of the 2008 global crisis and private equity s potential role in rebuilding our financial system. Schwartz fast–paced, conversational style makes for a welcome contrast to dry economic analysis well worth reading for both business leaders and students of finance. 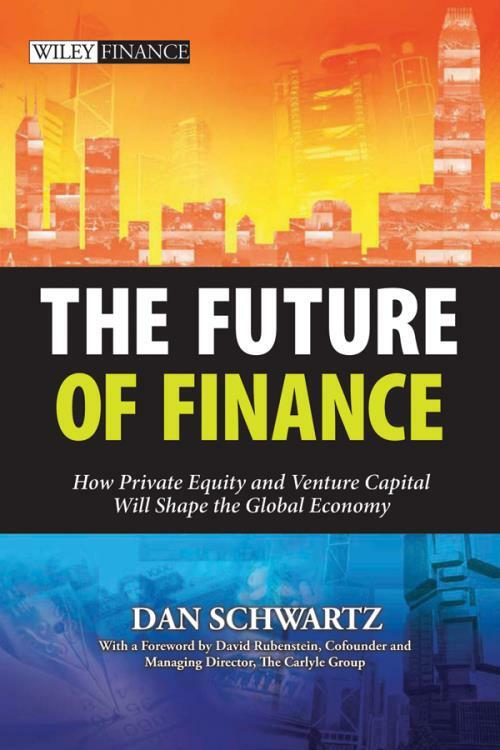 Dan Schwartz s The Future of Finance offers an insightful and compelling window into the world of private equity and venture capital. Schwartz has leveraged his more than 20 years of industry experience to produce a well researched and nuanced work that will prove invaluable to anyone interested in these fields. For anyone concerned about the future economic impact of global innovation, job creation, and finance, Dan Schwartz s comprehensive new treatise is a must–read. Replete with in–depth perspectives of dozens of the most senior global venture capital and private equity leaders and numerous case study examples, this gem artfully explains the dramatic changes happening in these vital industries and how government leaders, policy makers, entrepreneurs and investors must adapt for continuing success in the second decade of the 21st century. Dixon R. DollCofounder and General Partner, DCMChairman, U.S. National Venture Capital Assoc. (2008–09)From cottage industry to multi–billion asset class, Asian private equity has transformed the region s financial and corporate landscape in two short decades. Dan Schwartz was present at the beginning of this fascinating era as iconic spokesman and entrepreneurial founder of AVCJ. His contribution as chief convener to the industry helped shape an asset class. The Future of Finance is forward–looking while drawing upon the rich past of an industry s development amid volatile cycles, financial crises, pandemics, capital excess, capital drought and Darwinian struggles. Many of the prime movers, who paved the way to the future, have shared privileged views with Dan over the years and now on these insightful pages. Dan Schwartz s extensive and experienced network has enabled him to tap the key issues and insights of today s leading private equity and venture capital practitioners around the world. This enlivens Dan s stroll through Europe, North America and Asia as he examines the development of these private capital markets and these insights shape the prism through which he views a future for private equity in the coming decades. Dan Schwartz is the person best placed to write about the history of the private equity industry in Asia he was there right from the beginning. In nearly two decades, he has been a keen observer of the industry s developments and market trends. He was the cheerleader when the industry was down and he has been a friend to most of the leading practitioners, a position that provides him with unique insights into the actual workings of the industry as described in the book. The New Corporate Theory introduced in the last section of the book is an interesting thesis. If it comes to fruition, it will transform the shareholder–driven corporate governance model as we know it today. CHAPTER 1 Tomorrow Will Be Different than Today. CHAPTER 2 Private Equity and Venture Capital: A Primer. CHAPTER 3 2009: A Very Challenging Year. CHAPTER 4 2010: Private Equity and Venture League Tables and Niches. CHAPTER 5 Private Equity and Venture Capital in Markets Around the World. CHAPTER 7 The Next Decade: A Future Scape. CHAPTER 8 Toward a New "Corporate Norm". The Class of 2010 (People Interviewed in the Book). It is Private Equity 101 for anyone who wants to understand the nuts and bolts, its players, jargons, and the issues plaguing the industry in a post–Lehman world. Synthesising the thoughts of the best minds in the private–equity business along with his own, Schwartz creates a masterful discussion of the industry, past, present, and the way forward. The author offers insights into future opportunities and the new economic paradigm ahead of us, not with the intention to lionise but to explain and to look critically at the industry s present and future. The Future of Finance – How Private Equity and Venture Capital Will Shape the Global Economy offers an insightful and compelling window into the world of private equity and venture capital.